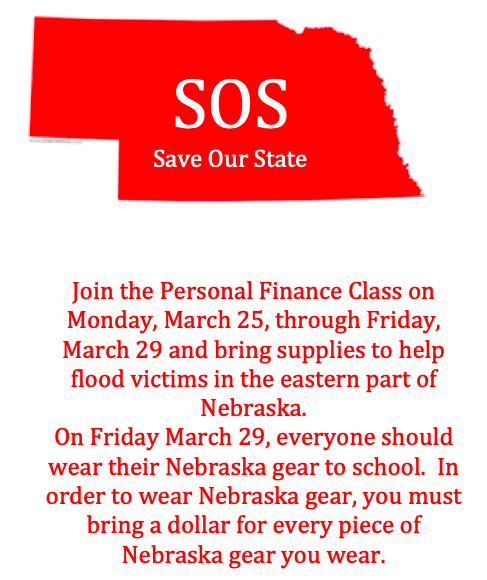 March 25-29 Paxton Personal Finance students will be accepting donations to help with the flood relief in the eastern part of the state. Supplies that are needed include: water, gatorade, snack packages, diapers, paper towels, dental hygiene products, trash bags, sponges, rags, safety goggles, bleach, disinfectant wipes, and dust masks. On Friday, March 29, we invite everyone at school to wear Nebraska gear and to pay $1 for every Nebraska article you wear. This money will be used to purchase more necessary supplies.